The medicinal uses of ginger for treating common ailments can be long traced through history. However, it is sometimes overlooked that ginger can interact with other herbs, supplements, and medications. For that reason, when it comes to herbal treatments, you should always consult your primary health physician. 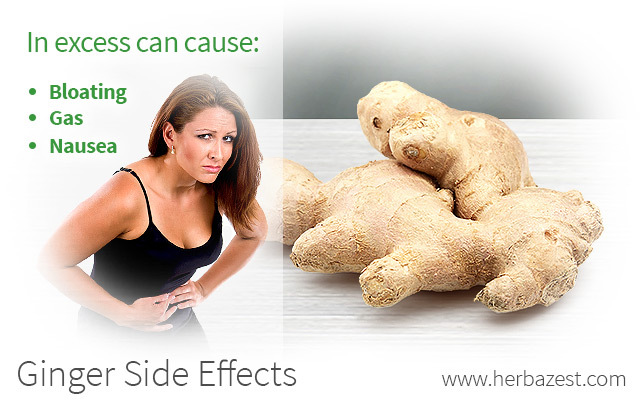 Even though it is rare to experience side effects of ginger, you should act with caution. Although most research suggests that consuming ginger is safe, and side effects are typically not reported if taken in small doses, like all good things, having too much ginger can have undesirable consequences. Some reported side effects of ginger associated with overconsumption include gas, bloating, mild heartburn, nausea, belching, diarrhea, and mouth irritation. It is also worth noting that most side effects are associated with taking high doses of dried ginger, but they may be reduced if proper amounts are consumed with food or in the form of ginger supplements. The effects of ginger on developing embryos remain unclear. A study published in Reproductive Toxicology (2000) registered the effects of ginger tea administered to pregnant rats. The results suggest an increased risk of early embryo loss along with increased growth in surviving fetuses. However, a human trial, performed in 2001 at Chiang Mai University (Thailand), concluded that ginger is effective for relieving the severity of nausea and vomiting during pregnancy with no adverse consequences on the fetal development. Additionally, ginger has been recognized by the U.S. Food and Drug Administration as a safe food additive. Like other herbal medicines, ginger may cause undesirable effects if taken under certain conditions or with other medications or supplements. People with gallstones and heart conditions, people taking medication for diabetes, as well as women who are pregnant or breastfeeding should consult their doctor before taking ginger. While there has not been any research specific to dosing, most research has centered on doses ranging 250 - 1000 mg (1 g) of ginger, taken one to four times daily. It is not recommended for adults to take more than four grams of ginger daily in any form. Women who are pregnant should not take more than one gram of ginger per day. Blood thinning medications. Ginger is a strong thromboxane inhibitor and may interact with blood thinning medications - such as warfarin, clopidogrel, or aspirin - and increase the risk of bleeding. Anesthesia. Ginger should especially be used with caution if you are likely to undergo neuraxial anesthesia, as there is the possibility that it may contribute to the formation of an epidural hematoma. Diabetes medications. Ginger should be taken with caution if you are also taking medication for diabetes, as it may lower blood sugar and increase the risk of developing hypoglycemia. Blood pressure medications. Ginger may increase the risk of developing low blood pressure or arrhythmia if taken with medications for treating high blood pressure. Overall, ginger can be safely taken to treat many common ailments, but it should always be taken with caution if you have a pre-existing condition or are taking other medications. If you are unsure whether you should be taking ginger, or the potential interactions or if the side effects you may experience are not clear, be sure to consult your doctor before use.